Furnaces are indispensable tools for solid state chemists. A variety of different kinds of furnaces exist, each with their own capabilities and limitations. This document discusses the two most common types found in a solid state or Inorganic chemistry laboratory. A tube furnace is designed to heat a tube that is usually 50 to 100 cm in length and from 25 to 100 mm in diameter. Samples are placed inside the tube in ceramic or metal boats using a long push rod. The tube is surrounded by heating elements which may also incorporate a thermocouple (a thermocouple can also be inserted down the tube if desired). While these are shown horizontal, tube furnaces (particularly those that are not of clam-shell design) are often used in a vertical orientation. This permits the tube, furnace or a suspended sample to be slowly moved during the experiment, a technique often used for slow cooling or crystal growth. Tube furnaces are the furnaces of choice for crystal growth given their small volume and precision with which the temperature can be controlled. Tube furnaces also have a significant advantage over other types of furnaces. The ends of the furnace tubes (which usually protrude 10 or more centimeters from each end of the furnace) do not get very hot and so a variety of different adapters may be placed on the ends. This permits one to perform a reaction under a controlled atmosphere (pure oxygen, nitrogen and CO/CO2 are typical examples). In a typical setup, gas flows in one end of the tube and then the gas (and any evolved gases) exits through a bubbler. The Lindberg furnace shown above is a single zone furnace, meaning that it has only one set of heating elements and controller. For techniques such as vapor transport synthesis or chemical vapor deposition, a two or three zone furnace is often used. 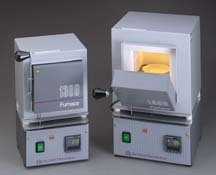 The Lindberg three zone furnace shown below and the Linn furnace shown above can be set to heat three different segments of the tube to three different temperatures simultaneously. Furnace tubes can be made out of a variety of materials. Quartz is commonly used for temperatures below 1,200 degrees C, and alumina or yttria-stabilized zirconia (among others) can be used for higher temperatures. It should be recognized that the temperature inside a tube furnace drops off rather quickly as one moves away from the center of the heating zone. If maintaining an exact temperature is important, the sample(s) should be placed as close as possible to the center of the zone (or thermocouple). One can also insert a calibrated thermocouple down the tube to generate a temperature vs. distance profile if exact temperature control is critical. Photos courtesy of Thermo Scientific. Box furnaces are very handy when large or many samples need to be prepared. 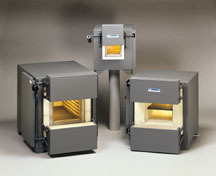 It is much easier to add or remove samples from a hot box furnace than a hot tube furnace. Box furnaces are not often used for crystal growth because the convective currents can cause the temperature inside to fluctuate slightly. In addition, maintaining a controlled atmosphere in a box furnace is usually not feasible. No matter what kind of furnace one uses, it is important to keep materials from spilling or depositing on the walls of the furnace. In tube furnaces, this is not a problem unless a tube is not used (usually a bad idea). If material spills on the furnace refractory material or heating elements, these can burn out prematurely and are expensive to replace. In addition, certain compounds and elements may undergo vapor transport reactions between the walls of the furnace and the samples (often with disastrous consequences). Box and tube furnaces are available starting at about $1,000 for a small unit and non-programmable controller. Prices can go much higher as one adds multiple zones or accessories. Programmable controllers are very desirable, especially for tube furnaces. The one shown here from Eurotherm has dimensions of approximately 10 x 10 x 20 cm and has many useful features such as temperature ramp programming, alarms, two digital inputs and accuracy of 0.25%. A good controller can cost $1,000. A hypothetical temperature ramp program for single crystal growth in a tube furnace might include ramping to 1000 degrees C at 25 degrees per minute, holding isothermal for several hours, ramping down at 0.2 degrees per hour to 975 degrees C and then ramping down at 0.5 degrees per hour to 500. There are many variations, of course. This page was last updated Monday, March 30, 2015. This document and associated figures are copyright 1996-2019 by Rob Toreki. Send comments, kudos and suggestions to us via email.